“I am thirsty.” These words spoken just before Jesus gave up His spirit on the cross reveal the need for life’s most basic requirement: life-sustaining water for the body and the soul. The crucifixion’s slow and agonizing death with its depletion of bodily fluids would cause a human body to dehydrate to the point of suffocation. The blood pouring from the Lord’s hands and feet and from His lash wounds would deprive His body of its normal blood flow, blood flow which carried necessary oxygen to all of the body’s organs. Water was desperately needed. Instead, Jesus was mockingly offered a sponge soaked with wine which had turned. After tasting it he rejected the old wine and its numbing effects. “I am thirsty” indicates the Lord’s need for water but more importantly these words also reveal that the Living Water, God the Holy Spirit, was also leaving the Lord at this point in time. Because Jesus bore the sins of the world He could not have fellowship with His Father and the Holy Spirit until His work of atonement was complete. Until then The Trinitarian Well of eternal fellowship was cut off from the Son of God. 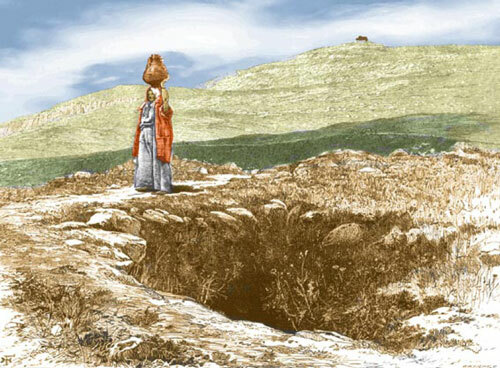 In place of this Well, Jesus chose to drink from the bitter cup of God’s will. by night, but I find no rest…. In this act of substitutionary atonement the Lord’s body bore all the sin of all men for all time. On the cross Jesus rapidly became depleted from loss of fluid and, as Psalm 22 tells us, from the loss of Living Water – Jesus was forsaken by the Father and the Spirit. “Because he poured out Himself to death” Jesus became as a barren desert, a desolate place with no water. He was made sin for us. In the gospel narrative the apostle John relates the true story of Jesus meeting a woman of Samaria at Jacob’s well. The well and the field surrounding it were gifts from Jacob to Joseph. And you will remember Joseph. He is the one who received good gifts from his father (the coat) and bad treatment from his brothers. I have no doubt that the well was, well, well-known to many who traveled though the area. I’m sure it was on the map of those seeking to quench their thirst, thirst brought about by the day’s relentless heat. John’s account tells us that as Jesus was traveling from one place to another he became tired and thirsty. He stopped outside the town of Sychar at the well to rest. As Jesus sat down near the edge of the well he told his disciples to go and get some food in the nearby town. It is midday. The sun is directly overhead and the heat is stifling. Jesus had no means of retrieving the water from the well. You can imagine someone being thirstier when they know that water is just out of reach. As Jesus sits resting a woman from the town of Sychar approaches the well carrying her clay jar (I am assuming some things here.). The woman comes to the well in the middle of the day because, I believe, no one else will be there during the hottest part of the day. She has her reasons for not wanting to be around the other women of the town: she sleeps around. Jesus, having already gotten the woman’s attention by recounting intimate details of her life, responded to her question about true and valid worship as the Source, the well-spring of Truth. Water flows through John’s gospel. John the Baptist baptized “with water so that He (Jesus) might be revealed by Israel. In the above passage we learn about Jesus chatting with a woman as he sits next to a well. There He talks about the everlasting living water which wells up inside you if you accept it. In a previous passage John recorded Jesus’s first sign: turning water into wine at a wedding in Cana. In the passage after the Jacob’s well story John tells us about a lame man who had been trying for thirty years to enter the healing pool in Bethesda. The water of the pool would bubble up with curative power whenever the Spirit stirred it. But the man had his excuses for not being well. In a later passage John recounts Jesus walking on the water to meet the disciples in the middle of a lake. Are you thirsty? Are you trying to quench your deepest thirst with the things of this world, things that quickly run ‘dry’ from everyday use? Do more clothes, more electronic gadgets, more Facebook friends, more entertainments, more tattoos, more tipping points, more of anything this world has to offer satisfy your deepest thirst? The woman at the well had her life of men. She had her connections. She also had her water bucket. She brought this bucket to the well everyday to get the water she needed to survive. The woman could argue religion and politics with the best of them but she was thirsting for something more. She may have wondered “is that all there is?” Is that all that life has to offer someone like me, a woman of Samaria marginalized by my own community and holding on to an unsure belief in an object of worship others are telling me to believe in. We know that drinking water is necessary for life. We listen closely to health programs that tell us to drink several glasses of water a day to sustain our bodies, to help them function properly and to replenish the oxygen our systems need. As you would imagine the quality of water that you drink is critical. Undoubtedly, water that contains filth would do more harm than good. Is the well water you are drinking clean and pure, refreshing and restorative? Or, is it filthy with parasites making you weak and sick?